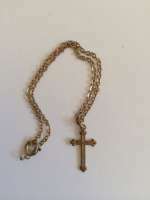 Original and quite lovely fashion doll Crucifix of brass with a chain. L.4-3/4"/ 11,5 cm clasped. In beautiful condition. Suitable for a doll ca 16"-20" /40-50 cm tall. Ca 1880. Provenance: Washington doll Museum. 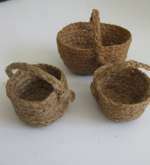 Here are three old hand-woven straw baskets for doll house or a small doll. Very fine condition. The baskets measure Oval H. 4.5 cm x 6 cm, round: H.3 3/4 inch D.3 cm and H 3 3/4 in x D 2.5 cm. All measured with handles. Very fine condition. Note: The price is for one basket. 12"/ 29 cm. 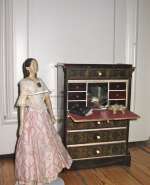 Exceptional Doll size Waltershausen Secretaire. Germany ca 1870. Classic drop-front Waltershausen Secretaire with the original stenciling , featuring handsome paper lining and trim in the cozy interior. This useful piece would make a great miniature accessory for fashions, chinas or paper maches and be perfect in a large-scale dollhouse,too. 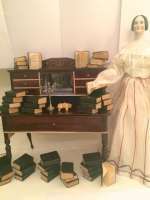 Waltershausen dollhouse furniture works very well with many types of dolls, as well as in large dollhouses. This handsome Biedermeier Secretaire with a drop down front, behind which you have the writing space with 3 small drawers at each side of the mirror. 3 large drawers to open under the drop down desk. Original paper. Strong gold stenciling. mirror, knobs, paper all original. No repairs. Excellent conditiond. 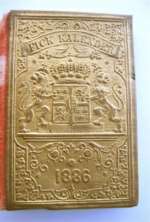 Made in Germany circa 1870. A lovely piece to add to a doll vignette .Very good condition. The size is H. 12"-W.7,5" D.4,3""/ 29 ccm x 19 cm x 11 c cm. Made in Waltershausen, Germany ca 1870. 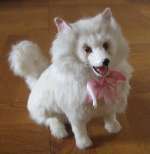 7 1/2" (19 cm) ADORABLE ANTIQUE French sitting fur Spitz dog with inset glass eyes from ca 1880. This is such a great dog to add as accessory for a FRENCH FASHION DOLL or bisque doll.The dog is covered with real fur paper mache. He has inset brown glass eyes with pupils, original pink band around the neck.He is is in great condition all over! condition, A very special item for the collector of exclusive accessories and dolls.. 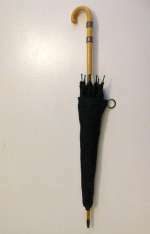 Antique French black silk Parasol with Ivory handle. 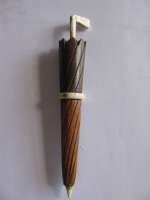 Antique French Ivory parasol-originally sewing etui. Ca 1890.